Ok…so let’s get this out of the way. If a character has spider driven powers, instant comparisons to the holy grail of comic books, Spiderman, will be made immediately. 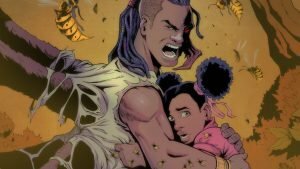 But the writer/creator, Greg Anderson-Elysee, takes this spider-powered teen in a complete different direction, basing the story on a classic African diaspora story and putting a modern-day spin on the tale. 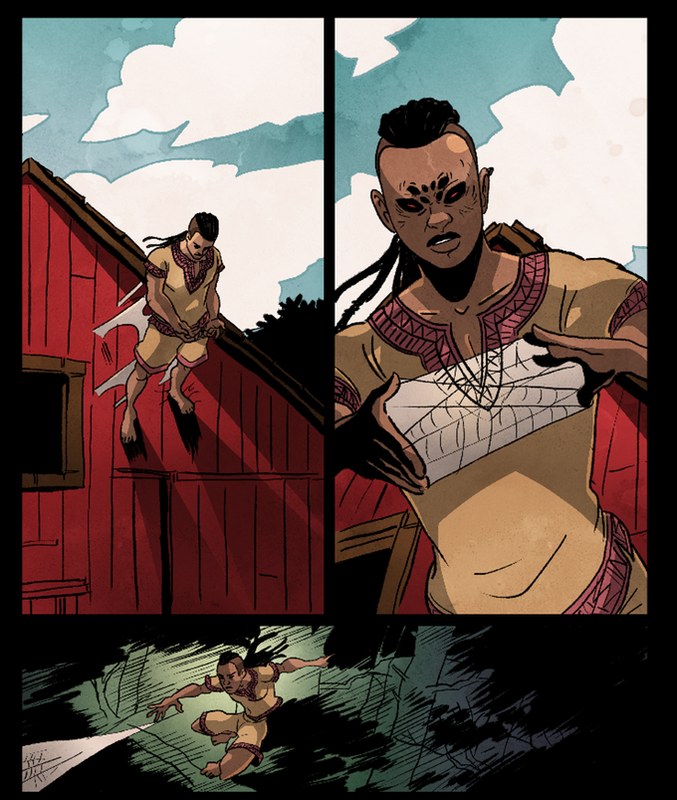 Anansi is a character that originates from West African folklore. His stories have moved from their original homeland and evolved into other forms of literature and media over the generations, and Is’nana the Were-Spider cleverly takes that history and expands on it in an interesting way. The reader is introduced to the story of Anansi the spider and his run in with the M’boro hornets within the first few pages of the story. The writer then introduces the actual Anansi in the form of a spider, reflecting on parental troubles with his young son and title character of the book, Is’nana. Is’nana is a serious teenager who is caught up in a battle of his own with a group of super powered hornets trying to bring back their queen. As far as powers are concerned, he has plenty to fight with. Is’nana can shoot webs from his body, but the viewer will have seen little of him using this to swing around. No mask and tights are present here, as Is’nana wears comfortable African styled flowing clothes that move seamlessly with his long braids. Is’nana has no problem with using other spiders to sense the world around him with the use of “spider-eyes”, and uses webs to wrap up his foes effortlessly. 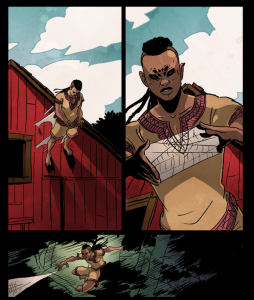 The author has clearly crafted his own vision of a spider hero very much based in this African lore, and no one will mistake Is’nana for anything other than his own hero. Artistically, this work feels almost manga in nature. Characters have big eyes and reactionary faces that jump off the pages as one flips through the book. The dialogue based pages are full of brighter colors, while the late fight seen at night is full of reds and purples that lend to the action scenes. The regular humans are a bit lacking in both their dialogue and art style as if they are supposed to blend into the background. However, the “hornet people” are excellently rendered, with a zombie like ferocity in their sytle, color, and lines. Is’nana is crafted with extreme care here. Every scene that he is in is dynamic. But personality wise he leaves more to be desired. Granted, his backstory is one that makes him more serious in nature, but his stoic demeanor could make him less relatable as a character down the road. Is’nana the Were Spider is a creepy, but exciting adventure into this world of bees and spiders. The book clearly differentiates itself from Spiderman-type stories in every single way, and one should appreciate the African background that it takes its inspiration from. Is’nana will continue to evolve and grow as a character and I am curious to see where he ends up in his battle against the bees.